If there was any question as to whether or not fans of the Pittsburgh Penguins were anxious to see their team skate on CONSOL Energy Center ice again, those inquisitions were answered loud and clear during Wednesday night’s free Black and Gold Game. Approximately 18,000 fans came out in droves, filling the arena to the rafters and many standing throughout just for a chance to see their favorite hockey players in action once again (official attendance could not be compiled without a ticket count due to the game being open and free to the public). The opening faceoff didn’t commence until 7 p.m., but the line began approximately nine hours earlier. The man at the front was 21-year-old Jeremy Banachoski of Shaler, who snagged his spot at 10 in the morning. Penguins captain Sidney Crosby couldn't be more grateful about fans lining up for a chance to see him and his teammates play. "That’s pretty amazing," Crosby said. "I think it says a lot about the people we have here and the support we have. We definitely appreciate it." For some fans, it felt as if the evening was a reunion with loved ones that was long overdue. The building was certainly stuffed, and Penguins management couldn’t have been happier with the tremendous attendance from the fans. 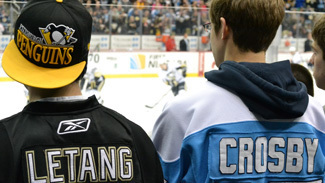 The Penguins players were blown away by the atmosphere, amazed at the turnout for an intra-squad contest. It’s something that newcomer Brandon Sutter got to witness for the first time in a Pittsburgh sweater. Pascal Dupuis has become accustomed to playing in front of a packed house and the veteran forward enjoyed skating in front of Penguins fans once again. No matter their title or capacity, one and all were ecstatic to be back inside the CONSOL Energy Center on Wednesday night – perhaps none more than the evening’s No. 1 star, the fans.